Congratulations to the Morton Middle School Sixth Grade Aviators of the Month for November. Pictured left to right are Tiffni Wilson, Ava Stephens, Karisa Ticknor, Brody Miller, Kellen Vandervort, and Jonathan Zirpola. Congratulations to the Morton Middle School Seventh Grade Aviators of the Month for November. Pictured left to right are Madyson Miller, Ashton Amburgey, Gwendolyn Nichols, Olivia Williams, Michael Roby, Kai Adams. Congratulations to the Morton Middle School Eighth Grade Aviators of the Month for November. 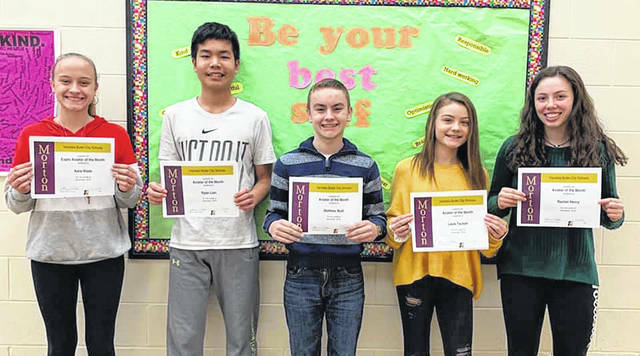 Pictured left to right are Kara Wade, Ryan Lian, Matthew Wolf, Layla Tackett, Rachel Henry. Not pictured is Joshua Matthieu.